I don't know about you, but sometimes I get a little tired of the usual cryptids. You know: Bigfoot, the Mothman, and Chupacabras. Every so often I just want to sit back in my flannel, pretend to be a lumberjack (that's why I'm wearing flannel), and hear a tall tale about a fearsome critter. If you're with me, then I've got a treat for you today. Tonight's the night I let you in on the secret of the Hugag. What's a Hugag, you say? Nothin' less than one of the most fearsome and dangerous critters ever to stalk the hinterlands of the lumberwoods, that's all. Pictured above in a highly accurate illustration from the 1910 edition of Fearsome Creatures of the Lumberwoods, With a Few Desert and Mountain Beasts, the Hugag (Rythmopes inarticulatus) is a large mammal of the Lake States. It's territory includes northern Minnesota and western Wisconsin, but is also known to thrive throughout the forests of Canada, even unto the Hudson bay. There are lots of similarities between the Hugag and your common moose, but DON'T BE MISTAKEN. There are several extremely important differences that will allow you to spot a dangerous Hugag rather than the totally harmless and safe wild bull moose. First off, you'll notice that the Hugag has no knees or leg joints of any kind. Indeed, its long legs prevent it from bending over and force it to remain standing at all times. Further, the Hugag is possessed of an extremely long upper lip, which keeps it from grazing. If it were to stand by a grassy hillock steep enough to reach with its stiff legs, it would merely scrape that big upper lip across the ground, and never manage to get any fodder in its mouth. Other features of the Hugag include a hairless head and neck, "strangely-corrugated ears" that droop downward, four-toed feet, and bushy tail. 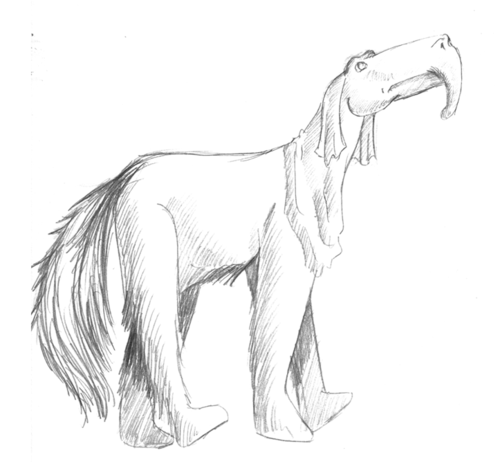 Overall, witnesses of the Hugag consider it to have a downright prehistoric appearance. The behavior and habits of the Hugag have luckily been recorded for posterity. The diet of the Hugag consists largely of twigs or the bark of trees. The creature is known to flop its big old lip around trees and strip the bark clean off. This accounts for the bare patches on trees you might see as you hike. It's said that the Hugag has a veritable "mania for travelling", and is capable of moving for an entire day without stopping. Thus, few hunters who have taken up the trail of the Hugag have ever returned to camp with a head to show for their troubles. At night, though, the Hugag does pause for sleep and refreshment. It does so by leaning its weight against a tree, as it cannot bend its legs to lay down. So, the next time you're camping and you hear a tree suddenly crash to the ground in the middle of the night, that would definitely be a Hugag. Successful Hugag hunters have been known to lay traps for their quarry by sawing notches in trees, such that when the Hugag goes to lean against them, they topple. The Hugag then, in its helpless state, is easily dispatched. The last known Hugag to be killed was on the Turtle River in northern Minnesota. It was reported to be a young Hugag, weighing 1800 pounds, and was found stuck in the mud of the riverbank. It was knocked in the head by Mike Flynn of Cass Lake. And there ya have it. I hope now you're all educated so that if you're ever wandering the woods and secret parts of the frosty Midwest, you'll know to look out for this most fearsome of American cryptids. Hugag!! I love the hugag!! !